Ukraine set to manufacture 290 aircraft by 2035. The state-owned aircraft company Antonov in Kyiv presented on 20 December a new Ukrainian freighter AN-132. "We are confident that this aircraft has a great future. We believe that there is a market of 260-290 aircrafts until 2035. I'm thankful for this festive day to all of our aircraft manufacturers and wish lucky fortune to the new Antonov, said President Petro Poroshenko, who attended the unveiling ceremony. Antonov An-132D (demonstrator) was developed at the request of Saudi Arabia. Antonov has signed a memorandum of intent on co-production of 80 An-132 for Saudi Arabia. 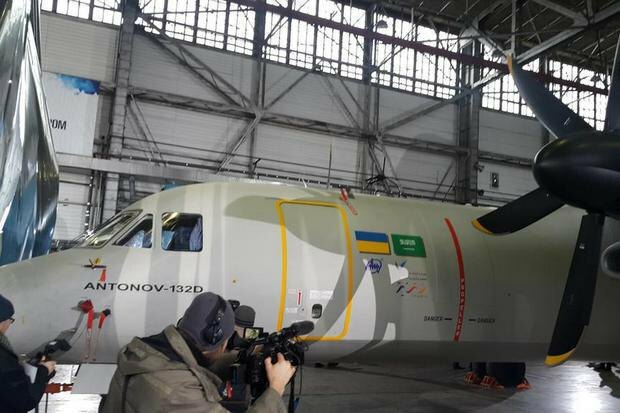 Some aircraft, like the prototype assembled at Antonov, will be produced in Ukraine while Saudi Arabia builds an aviation plant for the serial production of the aircraft and components in the territory of the kingdom. The intellectual property rights for the new aircraft will be divided equally between the two sides. A firm contract for 80 aircraft is to be signed after the delivery of the prototype. The production cost of the aircraft is not yet known. An-132 is the first Antonov aircraft that contains no Russian components. The aircraft is designed to fly at close and medium routes. It can carry out a wide range of tasks on transportation of cargoes. An-132 will have a cruising speed of 500 km/h and a maximum cruise altitude of 9000 m with a maximum load of 9.2 tons.